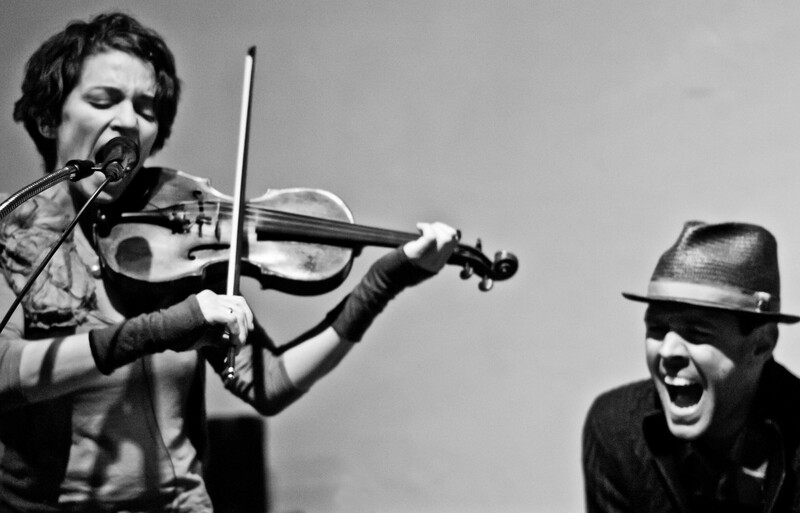 As the founders of several unique and progressive musical projects including Sleepytime Gorilla Museum, The Book of Knots, Tin Hat, and 2 Foot Yard, Kihlstedt and Bossi are accomplished composers and performing musicians who have also played with a wide range of contemporary artists including Tom Waits, Mike Patton (Faith No More), Madeleine Peyroux, and Tracy Chapman. In 2010 a change of setting and circumstance (i.e. the pair had relocated from California to Massachusetts and started a family) necessitated a new approach to their songwriting, recording, and releasing of music. First documented in the early 1900s, “Rabbit rabbit!” was a children’s superstition that promised good fortune within the next thirty days – but only if that phrase were a child’s first words upon waking on the first day of a new month. Similarly, every new song Kihlstedt and Bossi release as Rabbit Rabbit is a wish by both its creators and its listeners for the music to keep coming, month after month. Just before the launch of their current west coast mini-tour with My Brightest Diamond, the duo spent their in-flight time answering some questions for us about their subscription-based website and monthly release schedule, the benefits of networked collaboration and production, and the internet’s role in nurturing community among musicians and fans. Rabbit Rabbit is anything but timid when it comes to the business side of music: the project’s subscription-based website, Rabbit Rabbit Radio, delivers approximately one new song per month to its subscribers; then you release an annual CD that collects all of the year’s songs in one package – only this year’s upcoming collection will be available as a CD-less album, i.e. a limited-edition art print that includes a download code for the songs – what prompted you to adopt this approach, in terms of the move away from the CD, and the decision to go with a subscription model for the site? We toyed with the idea of self releasing and promoting our material for years before we pulled the trigger. For some projects, we printed our own discs to sell on CDBaby and at shows. But then we ended up sitting on a vast archive of unsold discs in the basement. We grumbled. We complained some more… Why aren’t our friends at our favorite indie labels with great distribution putting out our bands’ records? Giving us livable advances? On and on it went… Finally we decided to do something for real. Thus Rabbit Rabbit Radio was born. This also corresponded with our move back east and with our step into the treacherous realm of parenthood, which meant a shift away from our lives as incessantly touring road dogs… Which meant we needed to have a different way of staying in touch with the people who had been our faithful live audiences. We didn’t want to lose the satisfaction of creating full albums, but we wanted something more consistent and ongoing, which led us to the format you described above, where we release a song on the first day of every month, and the year’s output becomes an album. We also wanted to put back the context that was lost with the advent of the single downloadable track. We mourned the death of liner notes, pictures, studio notes and production credits. The Internet is a great medium for all kinds of nuanced behind-the-scenes peeks for music fans. It is by nature an inclusive medium. Finally, this was a place where we could incorporate words, photography, video, and all manner of relevant links to things we love. All wrapped around a song. Our subscribers can engage as much or as little as they want. They can just listen to/download the song, or they can delve into our list of inspirations and influences, our thoughts about the lyrics, photos of the studio session… Though admittedly, sometimes the photo section derails into a bit of a family slide show. Truth be told, after three awesome yet not particularly lucrative years of Rabbit Rabbit Radio, we’re gearing up to fold our subscription lot into the newly-unveiled subscription service offered by Bandcamp. We love the folks at Bandcamp. And they have a staff of people working round the clock tot deal with all of the invisible hassles of running a website that you don’t even really want to hear about, they’re so boring. We’re just starting to strategize that shift. Everyone should sign up on our mailing list so we can tell them how this constant search for how to be a functional independent musician all goes! One of the stated goals for the website is to find a means to engage with fans “in a more meaningful way in this post-[record]label world.” Generally speaking, are music fans less engaged now than they were before the collapse of the 20th century music industry? The Internet has brought us together! We don’t believe fans are any less engaged. Forums like Twitter and Tumblr give fans a chance to reach out and poke their favorite artists. Some of us maintain an actual presence on social media and are able to engage on a level previously reserved for the merch table. And all without leaving the house! Is that bad? Well, maybe the not leaving the house part is bad, but it sure is cozy in here! The sheer amount of music people consume leads us to believe that perhaps we don’t listen as obsessively or deeply as we used to, but then, many people we meet prove that theory wrong over and over again. We do love the great equalization that’s happening. This is truly the era of the anti-star. The more real and personal and full of warts you are, the better. The idea of the rock star is fading. And that can only be good. Is that “fiercely independent” aspect of the project a natural extension of your personalities; a deliberate mandate? Carla is fiercely independent. Matthias is married to Carla. So it goes. Technology makes it possible for creatives to work in new ways, with fewer restrictions in terms of time/distance and the means/cost of production. How do these innovations affect your creative process, individually and/or collaboratively? Having performed in several great bands and worked with many well-known artists, what has stayed with you from those experiences? What makes a great collaboration? Trust! Admiration! Shared musical vision! Wildly divergent musical vision! Doubt! Perseverance! Patience! Impatience! Irreverence! Stubbornness! Dedication! A rock-solid moral compass! A willingness to compromise! A total unwillingness to compromise! In short, a world of contradictions makes for great collaborations. Established artists often credit their early record labels for generating the momentum that helped to grow their audiences; whereas today’s young artists have many more promotional tools at their disposal and countless channels by which to reach potential fans, yet it seems to be more difficult for them to acquire and retain the attention of listeners – are they doing it wrong somehow? We’ve been lucky in that our previous bands had success in touring and selling a few records. We’re now fully on the other side, embracing self-promotion in a real way. It wouldn’t be possible without having slogged it out on the road for so many years, selling CD’s and shirts at shows, connecting face-to-face. If we were starting cold, with a cool idea but no following, it’d be dead in the water. Therein lies the rub. The 21st century conundrum. Everyone has the resources and technology. But, just because you built it doesn’t mean they’ll come. The best and worst thing is that there is no longer such a thing as a successful musician who hasn’t also had to take on the roles of travel agent, tour manager, graphic designer, publicist, fundraiser, booking agent, web guru. And then you have to find time to remember how your own songs go before you hit the stage. But there’s also something wonderful about knowing how the whole system works because you’ve done every job within it. There are times when we wish we had another team member. Any motivated, super-smart, generous, web-savvy, positive applicants, get in touch with us! You’ve played Vancouver before; what did you like about the city? We’ve played Vancouver once with Sleepytime Gorilla Museum, at Dicks on Dicks with Secret Chiefs III. It was raining and dark. It was a lovely show. The only other time we attempted to play we were turned back at the border for not having enough paperwork. Looking forward to seeing your fair city in the daytime! We do love the idea of concerts we can do from our living room for people sitting in their living rooms. With everyone in their PJs. And backdrops painted by our daughter, Tallulah. With surreal puppet show commercial breaks from our anti-corporate sponsors. We do like that idea. We really do. We’re also scheming to start a music festival on Cape Cod next year. Now that’s going to be a party!